With the truescale series of posts I did a few weeks ago generating a huge response, I decided to follow up on that series with my own truescale attempt and then comparing it to a regular terminator. A few folks had asked to see how my version stacked up against a normal terminator and I thought that was a fair question to ask. done the same way on my new blog. Looking back, my model is not so much truescale as it is just standing the model upright and getting rid of the hunched over look. That being said, take a look and judge for yourself the difference a 2mm spacer and some greenstuff can make. What did I do to my model? I didn't do much overall really. The two things that were "must" changes for me were the position of the arms on the torso and the height of the abdominal section. I tried a number of ways to adjust the height of the abdomen and settled on this way since it did the job the best for me. When I was constructing the model, I placed a 2mm spacer between the legs and chest section when I glued them together (1). Then I took some greenstuff and filled in the gap all the way around the model. I tapered it down to match the angle of the chest armour (2). Once it cured, I took my X-Acto knife and cut away the greenstuff just above the belt line and then cut a small section out for the abdomen (3). The short of it is that I "extended" the chest piece down to cover the gap I created when I added the spacer. It's actually quite easy to do. I thought it would be harder to do, but so much of that area of the model is blocked by other elements, you don't have to be perfect with your sculpting. The second and just as important thing for me was the adjustment of the arms. They have been lowered on the torso by 1/3 of their height. All I did was cut off the top third of the arm peg on both sides of the torso so the arms attached at a lower point. The end result is and extended torso with arms that look like they come out of a set of shoulders and his head sitting on top of that. 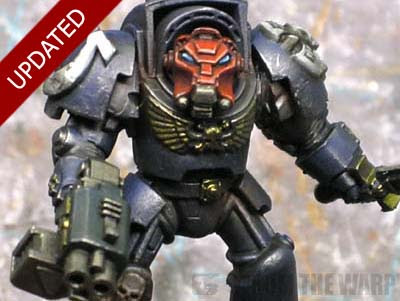 It gets rid of the hunchback look the current termies have. The sculpted shoulderpad icon and converted storm bolter are just extra. And some comparison shots of a regular unaltered terminator standing next to my version. They are pretty close in height when you get right down to it, it's just the look of the model that's changed considerably. What else would I add? I think if I were to add anything else to the model, I might do two more things. One is to add a thin spacer to the bottoms of his feet to bulk them up slightly and add a tiny bit more height. The other is a bit more involved where I would fill in the recessed areas of the upper leg armour and then resculpt new reinforcement ribs over that. That would bulk out the upper portion of the legs and give him some real mass overall I think. I really like the version I created here as it solves the two things that bothered me most about terminators. The beauty of this conversion is that you get a huge bang for your buck too. The cost is next to nothing in terms of materials (you can make the spacer out of anything you want) and the work is not all that difficult (and mostly hidden). As an added bonus, the rest of your army doesn't suddenly look out of scale either. I just can't see myself making the old style anymore. 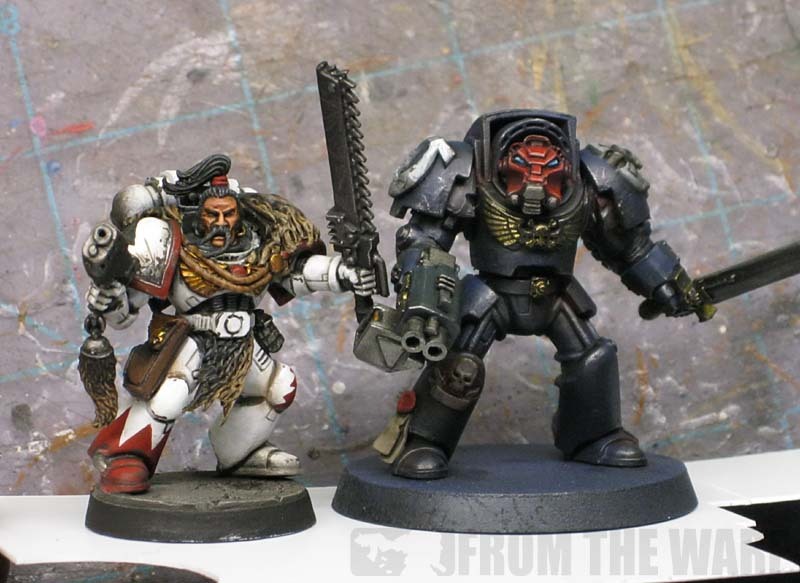 In one of the comments, there was a request to see the truescale model next to a regular power armoured space marine for comparison. I don't think the size is much different actually since unaltered termies are also a bit bigger than power armoured marines as well. I keep going back to the upright pose that I like more. What a great improvement over the standard model, not only in scale but by dropping the shoulders it makes the model appear as if there is more movement. I agree that the thigh armour now looks a little weedy, it may be tricky to bulk it up without making the lower leg armour looking out of proportion. Nicely done and thanks for posting Ron, looking forward to trying this out for myself. Thanks guys. It's not much of a change in terms of height... the real difference is in the pose or appearance of the model. Mohaniker: Bulking out the leg armour might be a bit tricky. I think it could be done without going overboard. The key would be just to fill it in more than build it up and out. Matt: The shoulderpads do look a bit larger now don't they. I like the bulked out look myself. I think it adds to the feel of the overlapping armour plates for protection. But you're right, they do look bigger now for some reason. That is a really simple improvement that pays off big time in the final overall look! I like it a lot too. It's an improvement on the base model for sure and I can see why it would be hard to go back. I agree spacers on the feet would be worth trying, but you might be able to avoid filling in the thigh recesses just by adding another couple of raised ribs. David: The payoff is the big thing. Not too much work and a big return. Porky: What do you mean a couple more ribs? Like in between the ones that are there already? I thought filling in the spaces wouldn't be too tough to do. I might try it this weekend. That I like, simple yet works wonders for the overall proportions of the model. @ Ron - Exactly that. There should be space for one more in each recess, between the ribs that are already there. It might add bulk without having any more smooth surfaces, or having to get the surfaces smooth. On the other hand, it might turn out that the extra vertical lines make the thigh feel slimmer than it does now. 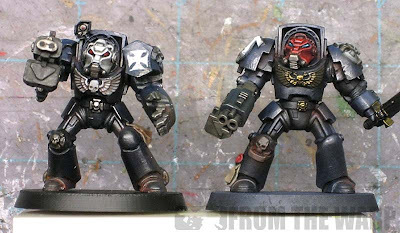 Weird...after all that I think I prefer the original model...Really like what you did with the storm bolter barrels though. Awesome stuff there. Ron, this is amazingly simple! 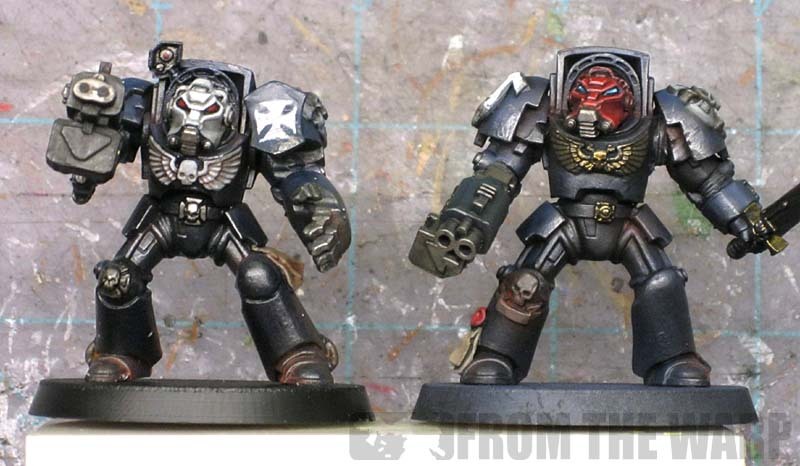 I had the same problem with the look of Terminators and you solved them both in one super simple conversion. I'm definitely going to use this with my Deathwing, thank the Emperor I haven't built them yet! Give yourself a pat on the back mate, you deserve a medal. Feral: I'm going to try this with some pre-heresy style termies. Porky: Hmmm... I think I'd fill in the gaps before I added more ribs overall. Tim: Really? That's interesting. I don't see myself going back after this. I like the look of upright one much better. Seeing them like this makes it even more pronounced for me. Dugatron: Glad you like it. Great work Ron! Very simple and effective. Like the others I will be using this on my terminators for sure. One solution for the legs would be to hide the crotch area using tabards, loin cloths, leather aprons and the like to hide the "thinness" of the thighs. Absolutely love this! Though where was this idea before I did 30 TDA for a Deathwing army? That aside, I still have another box of terminators set aside for when the new DA book drops to make a command squad from. I'm definitely going to give this a try then! What a huge difference that makes. 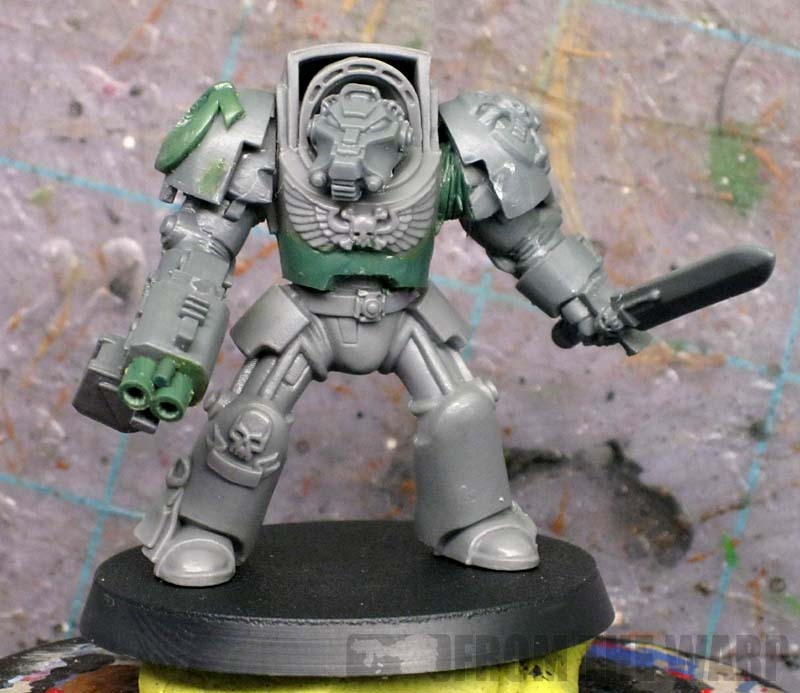 It makes him look more powerful and ready to obliterate some genestealers aboard a space hulk. I wonder what it would look like if you hadn't tapered the torso, but had squared it off. He looks a little thin in the waist. Of course I'm judging this just by a straight on picture. I would be awesome to see the "heightened" true scale termie next to the TSS true-scale termie you made a few weeks ago. And compare those two to a regular space marine. Yeh, there is something about how the shoulder pads are no longer flush with the back armor on top of the terminator...not to belittle your work. It is awesome and they both look great. Very nice work, Ron - Definitely feels a little mode 'real' with the posture tweaks you've done. Good stuff! keith: You are absolutely correct. Anything that would camouflage the area would help with the illusion. I wanted to see how the model stood on it's own so to say without any additions. Jason Gross: I opted not to square off the torso and keep it tapered for the visual aspect. I figured it would help blend in the conversion. Tim: I see what you mean. Ph0n1k: Let me see if I can snap a picture for comparison. 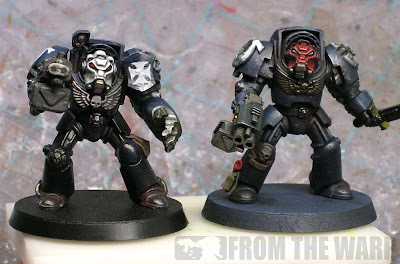 If/when I eve buy some GW Terminators, I'll definately be re-modeling them this way. The shoulder have always been a put-off for me with them. Well I definitely like this! Its a nice subtle change that just works so well to making the Terminator look more in scale. Ron - Long time follower of FTW (since 2009). I used to come to check out the blogroll. Not sure if this was mentioned in this article or in another, but I was wondering what you were using for your 2mm spacer to extend the legs and chest. A washer or plastic card stock? What exactly do you use for a "thin spacer to the bottoms of his feet?" I recall from another article long ago that you propped up your marines by adding a little plastic card from those "For Sale" signs??? Is that what you are using? Just trying to get an idea of what type of "spacers" you are referring to so I can go look for the same materials. Big fan of your work and always appreciative of your innovative hobby ideas. Thanks for always sharing and bettering the hobby community. But really, terrific conversion. I've never been much into true scale, but this fixes the proportion problem termies have quite nicely. I'd probably settle for a 1mm riser to keep the proportions a little better with the eagle but still give room to drop the shoulders. Narric: Just remember to sculpt the torso before adding the arms and you'll be fine. It looks like it's tough to do, but it's not. I thought it was going to be much harder. flingsumpoo: Thanks for the support! As for your questions, the spacer is a piece of tubular plasticard I have that I cut a small piece off. You could use anything you want really from a chunk of cured greenstuff (some people roll out their leftover scraps) to a few pieces of plasticard to build up the height. It really doesn't matter, but I found 2mm to be the right height for my tastes. The thin spacers at the bottom of his feet would be plasticard as well. They aren't on this guy, but any thickness plasticard or plastic yard sale signs (like I use) would work. Just depends on how much you want to add to his feet. Gorman: The height of the spacer is a matter of personal taste all the way. If 1mm looks "right" to you, then go with that and adjust things so they look the way you want. My hope was to show that you can modify an existing model without too much work to get a huge difference in appearance. I really like the work you did on the Terminator. The pose looks much natural. I also like the the work you did on the barrels. Could you pleas post a tutorial on this? Ron: you defintiely succeeded in that aim! Taste is a funny thing, and I think for the aesthetic you're going for 2mm is just about right. It is particularly nice to put all his together with your earlier 'thoughts' posts to see how the whole idea came about. Amonius: Thanks! The stormbolter barrels are super easy to do. Let me put something together and get it posted. Gorman: If I were to make a recommendation for folks looking to do the same thing, it might be to add a spacer based on what looks right and not by size. By that, I mean don't just add a 2mm spacer... add what looks right to you and then measure it to see what it comes out to be. That's how I did mine. I started out with one that was much higher and kept cutting it down until it looked correct to me. When I measured it, 2mm is what I came up with. Thanks for the side by side, to me they do look so much more hulking. Great job as ever. Looking great! Definitely makes the termies more imposing. Slicksauce: Thanks! I'm going to see how the bulked up legs look in my next test model. Ron did you change anything to the back of the torso? There is that little pill sized piece back there at the waist, just wondering if you moved it at all. Syko: Nope. That little piece you're talking about hangs down slightly on a normal torso. On mine, I have a tiny space underneath it now from the height adjustment. It's not even enough to catch your eye. I haven't played a game of 40k in three editions so the whole truescale movement is new to me, but "super humans" exactly the same height as every other figure has been a pet peeve of mine since way long ago. Nick Von Cover: Thanks! The whole idea here was just to get them standing upright. The overall height is not increased by much in the end, but the visual impact is much more. Hopefully your Praetorian Guard come to life now. Hello, first of all thank you for the site. Also a bit of question what you used as spacer? I want to try similiar approach with termies,but i quite new to whole conversion biz, and greenstuff. lardin: You could use just about anything you wanted for a spacer. In this case, I used a chunk of greenstuff that had cured. I usually take my leftover greenstuff and roll it out into a sausage shape if I have any leftover after a project. I took one of those rolls and cut off a small piece for the spacer here.